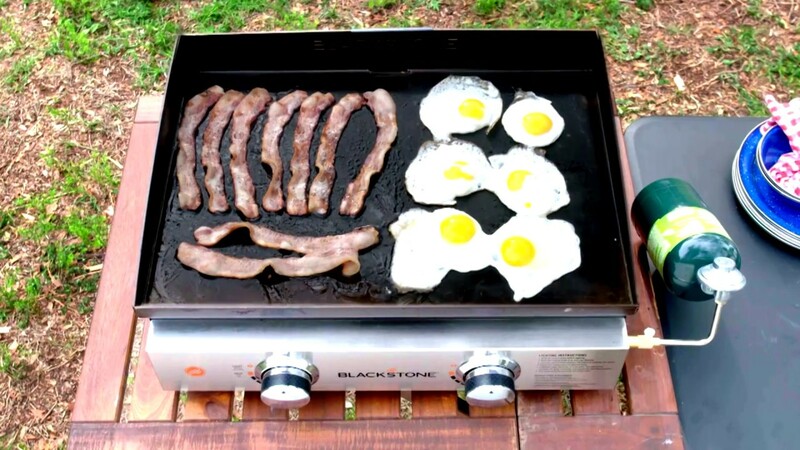 Take the Blackstone 22'' Gas Tabletop 2 Burner Griddle anywhere outdoors for big and versatile meals. Equipped with two independently controlled heat zones. You’ll have full control of the 330 sq. inch plate for simultaneous low and high heat cooking. The two "H" style burners provide even heat distribution for optimal cooking across the whole griddle. Stable on any surface from grassy hills to muddy terrain, so you can eat up delicious burgers, hot dogs, steaks, eggs, and more! No stress - easy to clean and feeds the whole family. Fantastic griddleThis griddle is a adequate size for a family of 4-6, particularly if you want to take it with you on a trip. I was afraid it would be a pain to clean, but it's actually pretty easy with a food-grade metal scraper. The surface is very slick too, I can cook eggs and crepes without sticking. If you're searing a steak and it wants to stick, the scraper will take care of that easily. The igniter is the only weak point. You have to turn on the gas, wait a moment for gas to flow, then click the igniter. Even then it sometimes takes a try or two. If this had electronic ignition, it would be perfect. But it works adequately if you apply some finesse. One other tip- if you're using a 20lb propane tank with the adapter hose, turn the tank valve on slowly so gas doesn't rush out. This trips something in the regulator that makes the flow of gas very low. If this happens to you, turn off the gas and remove the hose from the tank. Wait a moment for the trapped gas to release, then reattach the hose and slowly crack the valve. This needs to be called out more prominently in the instructions, I had never heard of such a problem with a grill until it happened to me. Totally avoidable if you know the "secret". After cooking on this griddle for a few weeks, I really want a 36" so I can warm tortillas or buns on one side while cooking meat or vegetables on the other, and still have a place to hold food for warming. I'm still glad to have the 22" for portability; it's adequate if you don't want to cook everything at once. 3.5 stars, but closer to three than four....Griddle cooks well, but one (possibly both) ignition leads were loose on arrival. Say possibly both as the left one was completely disconnected and hard to access (used a fly fishing hemostat to reconnect) and the other failed to spark. Spark failure may have been because the first linkage was off completely, or it may have been fixed when I tightened it. Also had a flame issue the third time I lit the grill. Only got about 30% of max flame unless I shook the full tank. Flame would then go to 100%, only to drop to 30 again. Disassembled and reconnected the propane lines (bulk tank adaptor) and eventually got it running correct. Could’ve been my shutdown procedure in which I killed the tank valve to off-gas the lines, then shut everything off after flameout, or it could be an issue with the regulator or adaptor. Had the look of a stuck regulator. Cooks well, food tastes the way it should. Some hot spots, some cold. Decent overall but the ignition wire issue was frustrating as it’s location is hard to access, the front is riveted together and that was a BASIC QC check that didn’t get performed. The Best!I have never personally used a griddle before but have always been interested in expanding my skills in one. I didn't know where to look, and I came upon this one. Best investment in a griddle ever! I soon plan to take my skills further and it all started right here, Thank you BlackStone! Big TEXAS cooking on a compact GRIDDLEI can't even think were to began since buying this griddle I use it also every single chance or day to cook on it! This griddle rocks, every morning I look forward to cooking my eggs (over easy) and hash-browns (Crispy of course) and some Texas toast and sausage. Grilling just went to a whole new level!!! Thank you so much, love my GRILL. You should get one... NOW!! !I´ve been cookin´ like a mad man ever since I got my 22" griddle. Oh man, I just love flippin´ them spatulas on the cold rolled steel. And the taste that comes out of this thing... oh dear... madly in love!!! I´ll definetly be gettin´ the 36" before long as well. The cleaning of the griddle is very easy... and... I never thought that I would say this... almost fun. Rear grease management system: Thumbs up!!! I live in Denmark (that´s Europe to you americans) and right now the snow is pouring down. Despite of this I was still out there flippin´ omelettes this morning. My girlfriend says that I´m obsessed with my griddle. I´m inclined to disagree. Besides, how would I know if she´s really talkin´ to me or the Blackstone deamon within me? I´m not gonna prolong this... this griddle works on so many levels. Don´t think... just get one... I did!!! Note: Griddle requires pre-seasoning prior to initial use. Please follow the guidelines in the user’s manual to pre-season your griddle.